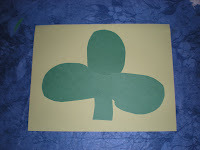 Here is a very easy shamrock for the children to make using handprints. 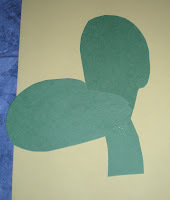 Trace the child's closed hand on the green paper. You will need three hand shapes. If they are good at cutting, you can trace three hands and let them cut them out. If you need to cut them, you can fold the paper, trace their hands, and cut them out all at once. 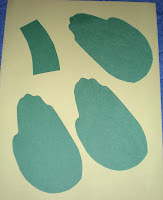 From the scraps of the paper let them cut out something that looks like a stem. Anything rectangular will do. Then all they have to do is glue one leaf at a time to the stem. 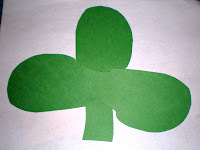 The shamrock is NOT glued to another piece of paper it is free standing. All done--that was easy!